Salmon and vegetables are roasted in one pan to keep cleanup easy. The roasted leek and shiitake are mixed into the arugula wilting the greens. A dressing of fresh lemon juice, olive oil, kosher salt and freshly ground pepper finishes the dish. Position a rack in the center of the oven and heat the oven to 450 F. Line a large rimmed baking sheet with foil. Spray the foil with vegetable spray. In a medium bowl toss the mushrooms, leeks, 3 Tablespoons olive oil, 1/2 teaspoon salt, 1/4 teaspoon pepper. Finely grate the zest from the lemon. In a small bowl mix the zest with 1 teaspoon salt and 1/4 teaspoon pepper. 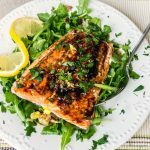 Arrange the salmon skin side down on the enter of the baking sheet and use 1 Tablespoon of olive oil to rub on both sides of the salmon. Rub the lemon zest mixture on the tops and sides of the fillets, and scatter the mushrooms and leeks around the fish in a single layer. Roast until the vegetables are tender and the fish is opaque in the center, about 15 minutes. If the fish fillets finish cooking before the vegetables, transfer them to a plate and brush them lightly or drizzle with balsamic glaze. Continue to roast the vegetables until tender, 3 to 5 more minutes. Combine the arugula and roasted vegetables in a large bowl. Squeeze 2 Tablespoons from the lemon onto the vegetables and toss to combine. Season to taste with salt, pepper, the rest of the olive oil and a dash more lemon juice. Divide the mixture among four plates and top each salad with a piece of fish and serve. It was just the two of us for dinner so we made two fillets but the full amount of arugula salad. The left over salad is still delicious the next day. Adapted from Fine Cooking Magazine recipe issue 95 - Roasted Salmon with Shiitake, Leek & Arugula Salad.